The undated photo shows Egyptian activist Ahmed Douma. Cairo(ANN)-A court in Egypt has fined Ahmed Douma, a leading anti-government activist, for his insulting remarks about the judiciary. 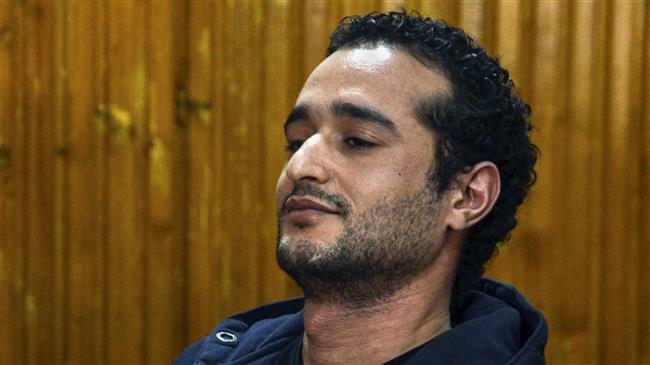 The court on Saturday ruled that Douma should pay 10,000 Egyptian pounds ($565) as part of his retrial over insulting the judiciary. Douma had been sentenced to three years in an original hearing in the case in 2014. He has been a leading figure in Egypt’s political and social movements since the fall of former dictator Hosni Mubarak in 2011. He has fiercely criticized the government of President Abdel Fattah el-Sisi for its way of treating dissent. Another court has sentenced him to life behind bars in a separate case over involvement in protests that led to Mubarak’s ouster. Douma was also granted a retrial over the case last October. But he faces accusations of illegal protesting, assaulting security personnel and attacking government buildings. Tens of thousands have been jailed since Sisi came to power in 2014, most of them members of the now banned Muslim Brotherhood party. Sisi, a former army chief, was elected one year after he led a coup against Mohammed Morsi, a senior Brotherhood member and Egypt’s first democratically-elected president. Many say Sisi’s lack of tolerance for political activism has cost Egypt dearly as the country still suffers from repeated terrorist attacks on security forces and the civilians. Sisi’s government has ignored increasing calls from rights campaigners and Western governments to tune down the massive judicial crackdown and defends the arrests as a way of preventing possible attacks. Courts have escalated issuing verdicts against activists over the past weeks as Egypt prepares for a presidential election next month with Sisi likely to win in the absence of a serious challenger.